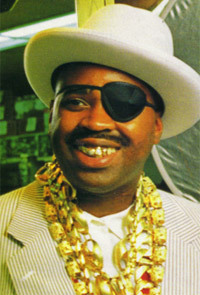 Gotta love that smile... Slick Rick... the originator of "La Di Da Di" ... will be @ Emo's on Dec 16th! ... now that's dope! I think friends should warn you when they send nasty websites while at work. I know it ruins the shock value but come on! My friend Ellen thinks it's amusing to periodically send me obscene links... so she sent me this today... AND I had a female co-worker sitting right next to me at the time. Geez... luckily I closed the browser quick enough. Richard Walters (born January 14, 1965), better known by stage names Slick Rick, Ricky D and The Ruler, is a black rapper. Originally from South Wimbledon, London, England, he moved with his family to The Bronx in 1975. Rick's characteristic eyepatch was acquired after being blinded in the right eye by broken glass as an infant. He is best known for a series of hip hop recordings during the 1980s, including "Children's Story" and "La Di Da Di".